A PONTELAND High School student has received a helping hand with her career in recognition of a successful charity drive. A special fund-raising day to raise money for CLIC Sargent, which cares for young people with cancer and supports their families, saw Philippa Aspinall collect £405 through a cake sale and donation boxes. Preparations lasted about a month, with Sixth Former Philippa and other students staying behind after school to make the cakes and put together posters. 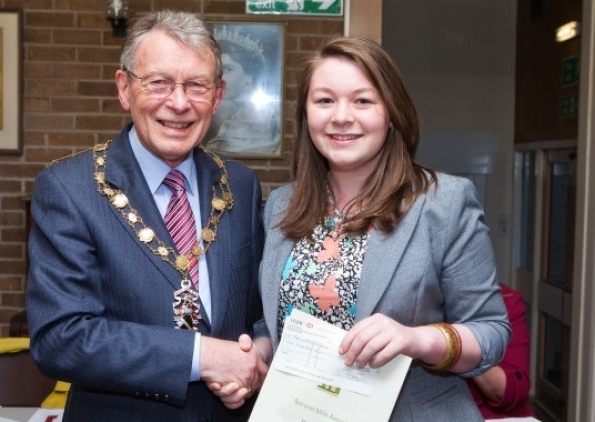 After being told of her achievement, Ponteland Mayor Robin Ramsay gave her a Mayor's cheque for £100. The 17-year-old was driven to do something for the charity after a grandson of a family friend was diagnosed with bone cancer. "This involved a lot of hard work, but it was worth it and I was delighted to raise so much money," she added. "I'm very grateful to the students and teachers who supported me and everyone who donated on the day. "Thanks to the Mayor for this cheque. I will use it to buy new art supplies as I want to pursue it as a career once I leave school." The Heddon on the Wall resident often does paintings and takes photographs of the scenery in Scotland and the Northumberland coast. She recently received tips from renowned artist Alexander Millar at the opening of his exhibition in Newcastle and is planning to attend an open day this summer in London for people to find out more about universities that specialise in art.